Do you need work anniversary celebration ideas? You’ve come to the right place. A work anniversary can be a special time for employees to reflect upon the previous work year: their successes, accomplishments and career growth. It’s also an important milestone for companies to recognize because it’s the company’s chance to show each employee they value the work that’s being done by that particular individual. Effective employee recognition starts with keeping an organized record of staff member start dates so no anniversary passes unnoticed. Next is finding a recognition method that works with your company’s goals and budget. Even a simple celebration of an employee’s accomplishments will boost morale and improve employee engagement throughout the organization. Publicly recognizing employees for reaching an anniversary, whether it’s their first or twenty-fifth, is a great, low-effort way to thank employees for their dedication to a company. Exec Comm suggests it can be as simple as sending out a company-wide email. Or use this work anniversary celebration idea: A more creative way to publicly commemorate this milestone is a lighthearted company gift. At Groupon, work anniversaries are recognized publicly through giving the employee a bright green personalized track jacket. Similarly, Influence & Co. publicly rewards its honored employees with a wrestling-style championship belt for creative contributions to the company. 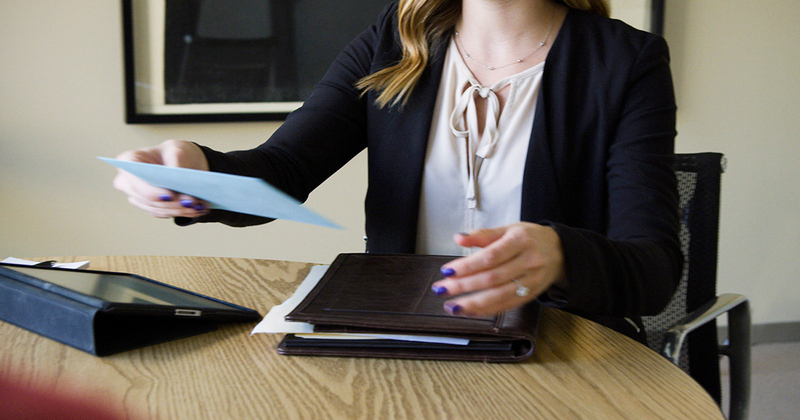 While these gifts are certainly creative, here at Hallmark Business Connections, we believe in letting employees choose what’s most meaningful to them. To do that, we offer years of service award certificates, which can be printed and presented in front of a large group or the entire company. Plus, you can add a reward code that employees can use to select their favorite gift card(s). Together, these allow you to easily publicly recognize and reward employees for their hard work. Personal gifts are great ways to make employees feel special and give them a reason to look forward to their work anniversary. Not sure what type of gift the employee will appreciate most? Give the gift of choice: a gift card for employee recognition. 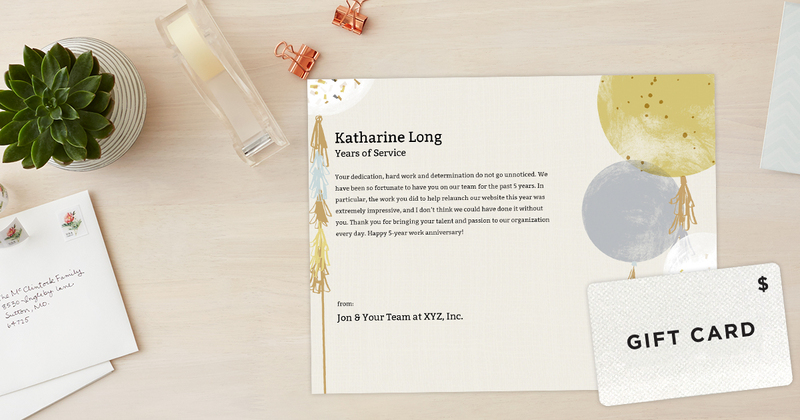 Redeemable at several major retailers, restaurants and more, Hallmark Business Connections’ recognition awards give employees the opportunity to celebrate their accomplishment in a way that is most meaningful and personally rewarding. Plus, a handwritten message commemorating the anniversary will add a personal touch. A work anniversary is best celebrated with a greeting card that can be kept as a memento for years to come. 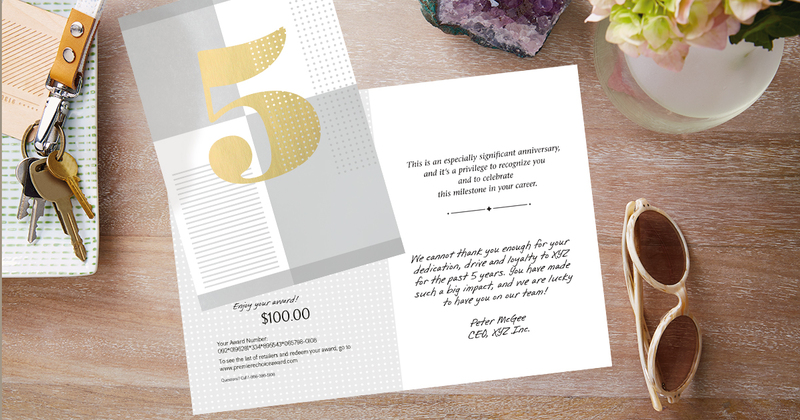 While seemingly humble, an anniversary greeting card with a handwritten message from the company CEO, upper management or mentors can brighten up an employee’s day while also being proudly displayed at their work desk or home. The reason that greeting cards, letters, phone calls or personal visits go over so well is because they are personal gestures. Another tip? Don’t worry about making the years of service recognition too formal. It just needs to be a genuine expression of appreciation. A few sincere words from management will be noticed and appreciated by an employee. To have a little fun, look at work anniversaries as a chance to celebrate with the whole company outside of the office. A few work anniversary party ideas from Chron include a company outing to a restaurant or sporting event, if the budget allows. A few other ideas are more budget-sensitive. Consider planning a company-wide 5K or head to the local softball diamond for some fun. 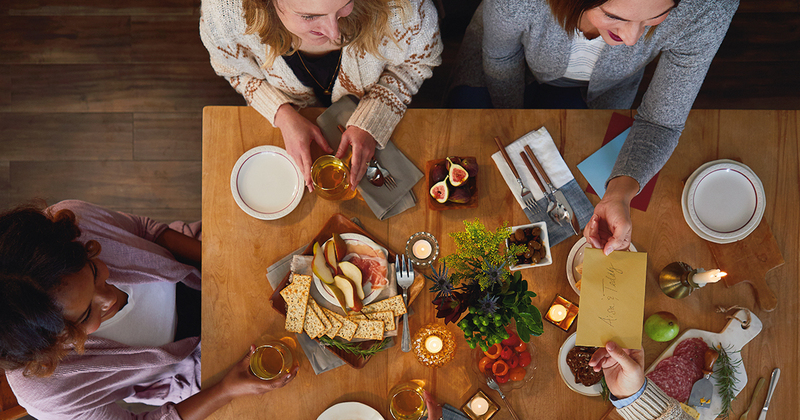 Consider other small events such as a potluck, game day or a small themed party. What’s a more fitting reward for another year of hard work than a day off? Some businesses use a floating holiday for employees to redeem around their birthday, but the same idea can be used for work anniversaries. Allow employees to take a day off on or around a work anniversary. According to Inc., paid time off is one of the best ways to celebrate a work anniversary. Employees typically appreciate a flexible vacation policy, especially if it allows them to celebrate personal milestones however they please. Employee anniversaries are an important milestone for both the individual employee and the company. 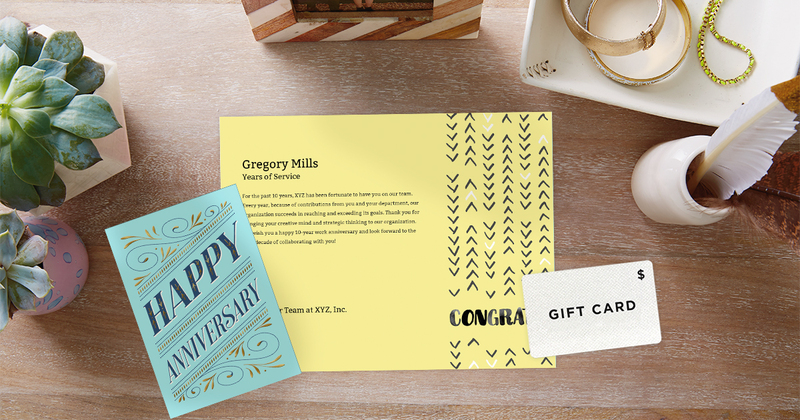 With these simple work anniversary celebration ideas, you can show your employees you value what they bring to the company. Want to take it a step further? Consider establishing a formal years of service recognition program at your organization. A years of service program not only honors an employee’s dedication and commitment, but it also recognizes how his or her efforts have benefited the company and everyone in it. We make celebrating the individual and the accomplishment a more memorable and meaningful event. Use these 5 work anniversary celebration ideas to make your employees feel appreciated. Need more help? Contact us today to discover how Hallmark can help you establish a years of service program at your company.